A currency used in a number of European Union countries. The name euro was the winner of a contest open to the general public to propose names for the new European currency, and as such is technically a neologism, although it obviously alludes to the common root of geographical names for the continent Europe, derived from Latin Europa, from Ancient Greek Εὐρώπη (Eurṓpē), the name in Greek mythology of a princess, abducted by Zeus as a bull across the Bosphorus. A coin with a face value of 1 euro. An abbreviation for European in any sense; e.g. "euro size"; "euro style pad". The plural recommended for use in official European documents written in English has been euro for some time, but this recommendation has been amended to euros. However, in Irish English the plural euro is now well-established. Macropus robustus, a wallaroo (macropod species). Shortened unetymologically from Europe or Europo- in compounds. 20th-century formation, perhaps echoing terms like Afro-, Indo-, Sino- etc. 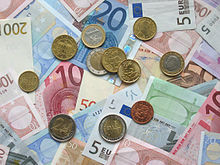 The euro (sign: €; code: EUR) is the official currency of the eurozone: 17 of the 27 member states of the European Union (EU). It is also the currency used by the EU institutions. The eurozone consists of Austria, Belgium, Cyprus, Estonia, Finland, France, Germany, Greece, Ireland, Italy, Luxembourg, Malta, the Netherlands, Portugal, Slovakia, Slovenia and Spain. The currency is also used in a further 5 European countries (Montenegro, Andorra, Monaco, San Marino and the Vatican) and the disputed territory of Kosovo. It is consequently used daily by some 327 million Europeans. Additionally, over 175 million people worldwide use currencies which are pegged to the euro, including more than 150 million people in Africa.